Here at SUP Inflatables we have made life as easy as possible by separating all of the Inflatable SUPs that we stock into clear catagories. 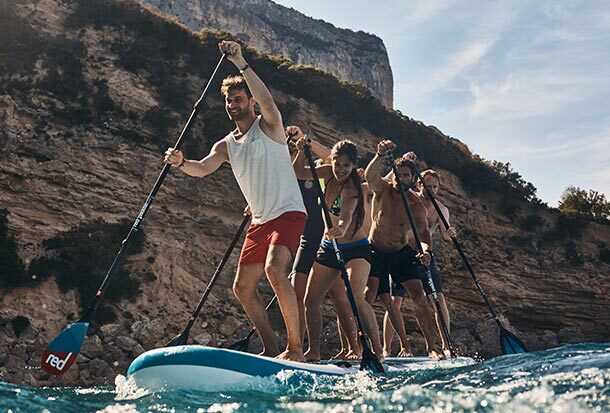 Each of these types of board have their own characteristics and some will suit you more than others, so read on to narrow down which inflatable SUP is right for you. Allround Paddle Boards are the choice for the majority of paddlers. They come in a range of different lengths and widths so that each person can find the perfect board based on their weight and how they want the board to perform. Allround SUPs generally have good glide for easy cruising, are stable and manoeuvrable. They can handle all conditions from flat-water cruising to surfing. Touring Paddleboards offer an amazing on-water experience. They are longer so have excellent glide and paddle speed and are wide enough to be very stable. They chew up the miles on long paddles exploring rivers, lakes or coastlines. They can even be taken into small surf for a bit of wave-catching fun. They won't be as manoeuvrable as an Allround SUP board but will travel much faster. A great choice for those who will spending the vast majority of their time on flat water. The term 'race' is a little misleading for the wider of the race boards with a width of 29"-30", as they provide plenty of stability for long touring paddles. They are not just for racing. If you are sporty and have good balance these inflatable sups will be excellent fast touring boards. They are one of our boards of choice for distance paddling. The narrower Race SUPs at around 26" are incredibly fast, but are really best for those with experience or the best of balance! Kid's specific paddle boards have the characteristics that make them perfect for children who love to paddle. They tend to be shorter than you may choose as an adult, and usually use the thinner and most lightweight construction to make them easy for kids to handle. Kids SUPs can come in allround and race shapes. Fitness Paddleboards are a relatively new introduction to the SUP market, feeding the rise of paddleboard yoga as it's very own discipline. The prefect yoga SUP is nice and stable, offering the additional benefits for the core that practicing yoga on a SUP creates, without being too unstable so that you fall in! With an allround, shape, these paddleboards are also good for allround flat water paddling, most fitness paddle boards will have the handle moved to the side as not to affect your yoga poses and also be slighty wider than the standard all round shape to aid balance. Inflatable Surf SUPs can offer performance on a wave that you wouldn't have thought possible from an inflatable. Developments in design and construction mean they are super stiff so ride a wave extremely well. They are short and hence very fast turning. 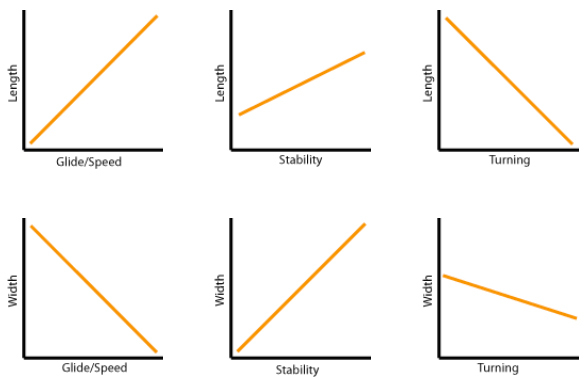 The low volume means that overall stability is not as great as longer boards. They are slowest to paddle in a straight line. 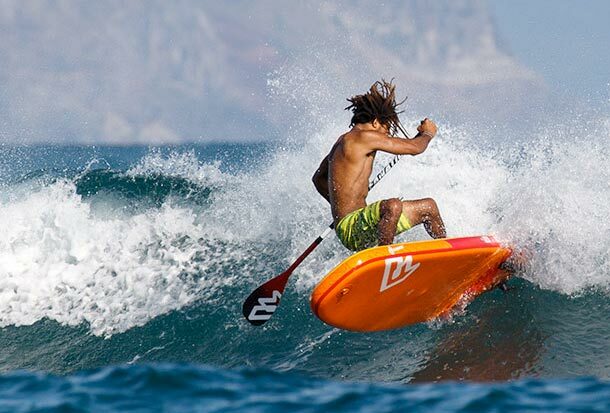 Best suited for those who will primarily use their Inflatable SUP in waves. White Water SUPs are fairly niche; you know who you are if you want one! 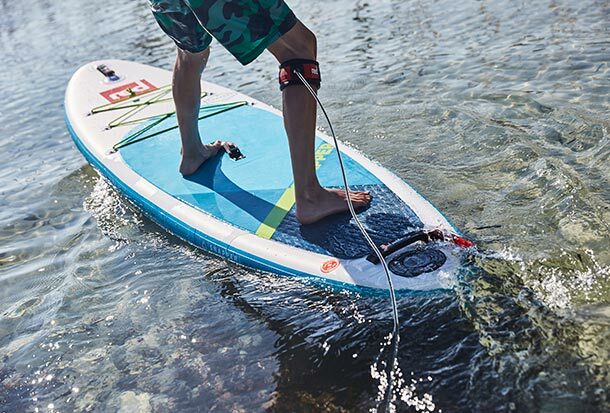 Specifically designed for running rivers, they are the perfect tool for this exhilarating type of paddleboarding. White Water SUPs are wide for stability and very short for the utmost maneuverability. They are made with the most bombproof constructions for rigidity and durability in the most extreme environments. These things are an absolute hoot! Giant paddleboards designed to carry multiple paddlers at the same time; whether on flat water or in the waves they are a real blast. A great addition to the fleet for watersports centres, a unique tender for yacht owners or be the envy of every family on the beach! Once you've narrowed down what type of paddleboard you're after, you will find that there are other options that can affect how a board handles. 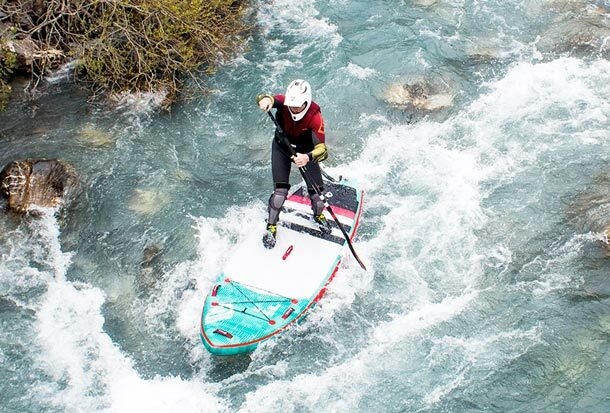 Getting to grips with how length and width effect the characteristics of a SUP is vital to understanding how they differ and choosing the best option for you, based on your weight and skill level and the sort of paddling you'll mostly be doing. 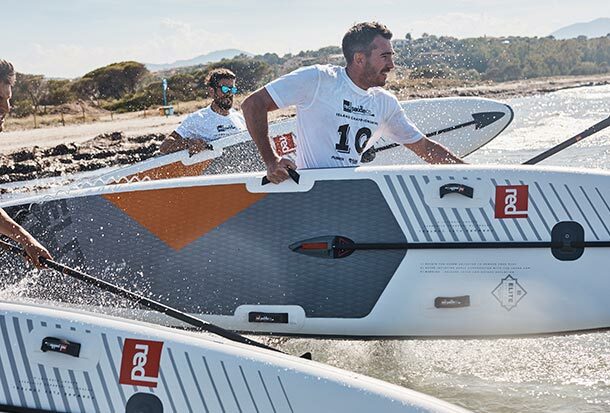 Choose your board baring in mind how the length and width will be determining factors in the performance characteristics of your Inflatable SUP. Length Length will have a great effect on glide/speed and turning. Longer boards will be faster but slower to turn. A longer board will be slightly more stable as there is more volume front to back, however width has the greatest effect on stability. Width will have the greatest effect on stability... wider boards being more stable. A wider board will have slightly less glide/speed. One more thing to consider when choosing your Inflatable SUP is the thickness of the board. There is a lot of rubbish about thickness out there on the internet from POP up brands buying the cheapest materials they can. Each thickness option has it's advantages which we have outlined here, but for full details on board thickness click the link below - Allround review - where the 1st paragraph goes into detail about thickness.